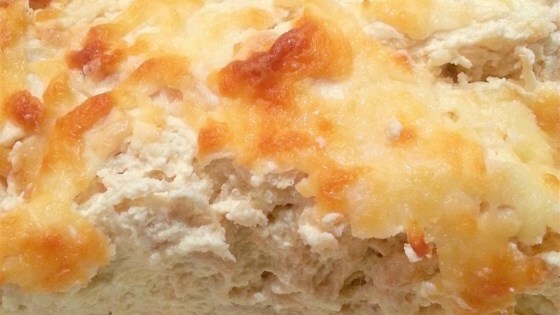 "A great alternative to the classic buffalo chicken dip for those that don't like spicy foods. This tastes just like garlic Parmesan chicken wings and is a huge hit with all ages! Serve with crackers." Mix butter and garlic in a skillet over medium-high heat until butter is melted. Add chicken; cook and stir until chicken is heated through, 2 to 4 minutes. Stir cream cheese, Parmesan salad dressing, and vinegar into chicken mixture; cook until well-blended and warm, about 5 minutes. Mix 1/2 of the Monterey Jack cheese and 1/2 of the Parmesan cheese into chicken mixture; transfer to a slow cooker. Sprinkle remaining Monterey Jack cheese and Parmesan cheese over dip. Cook on Low until hot and bubbling, 30 to 40 minutes. Instead of a slow cooker, you can put this into a casserole and cook it in a 350 degrees F (175 degrees C) oven for about 15 to 20 minutes, until cheese on top is golden and bubbly and dip is heated through. Two 10-ounce cans chicken can be used in place of the shredded chicken. Pretty bland flavor, it needed something else. I don't think I will make this again. I would've given it 5 stars but I modified it. I used one 8oz cream cheese and half ranch half blue cheese dressing. I also baked it instead of using the slow cooker. Sooooooo good! This was gone in two hours when I took it to work. It is amazing!! May try this with some seafood instead of the chicken.